First off, as a disclaimer, I have to admit I’m going to contradict myself a little in this article. But fret not, it should (I really hope) all make sense in the end, it’s just that there are a lot of things we have to take into account. So what the hell have hammers and feathers got to do with anything? Well, as you may know, there was a famous physics experiment that took place on the moon during the Apollo 15 mission. Astronaut James Scott dropped a geological hammer and a feather from the same height and they hit the moon’s surface at the same time. It demonstrates the concept that in a vacuum all objects are acted on by gravity the same amount, and so all things fall at the same rate. The experiment was conducted in its extraterrestrial setting in order to negate the effects of aerodynamic drag, a friction between the objects and the air; of course if it was done on earth the feather would’ve have taken far longer to fall because of its large surface area compared to its mass (remember ‘mass’ is what we measure in kg or pounds, and is what we commonly think of as ‘weight’. 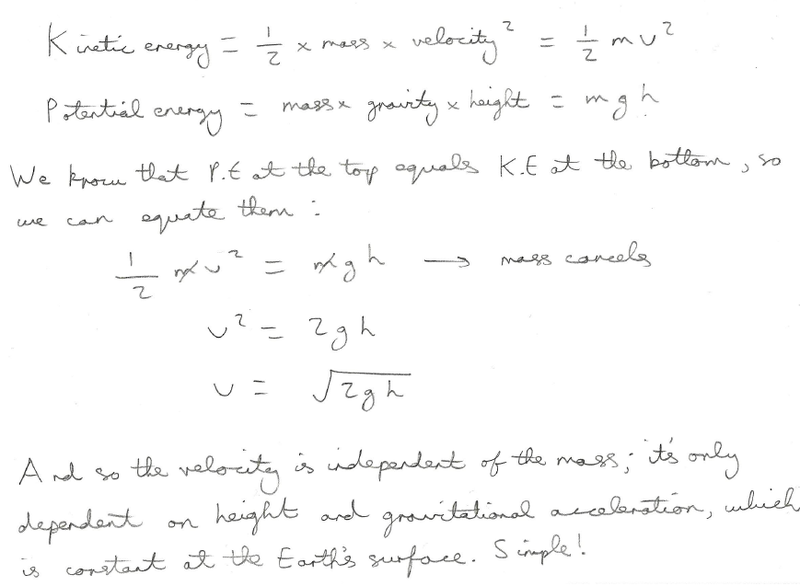 In actuality weight is slightly different; it’s a force, measured in Newtons, and Weight = Mass*Gravity). But this isn’t the whole story. Sure, the physics is correct, but obviously there are some factors other than just one dimensional energy analysis. If anyone has been to a theme park when a new ride is being built, you may have seen it running with crash dummies. These dummies are filled with water to give an accurate representation of how the ride will behave with a fully loaded train. If mass made no difference at all then this would be a pointless exercise. With roller coasters the point about air resistance isn’t very relevant; there will be little difference in aerodynamics between a loaded or an unloaded train, but there are other, less obvious ideas going on, and I’ll mention two key ones here. Therefore, as the normal reaction is due to weight, which is due to mass, and friction is due to normal reaction, in this case the motion of the train is affected by its mass. Therefore a greater initial momentum, for which we need a greater mass, will exert a greater magnitude force on the brakes, allowing it to complete its circuit more readily. So there we have it. The mass of a train generally speaking doesn’t affect how fast it goes, despite what intuition tells us, but there are a few physics principles that mean it’s still a very important factor when designing rides.